Are you struggling with debt and considering bankruptcy but not sure where to start? Our FREE ebook “Bankruptcy 101” will give you a great overview of what bankruptcy is, how it works, and what type of bankruptcy might be best for your financial situation. 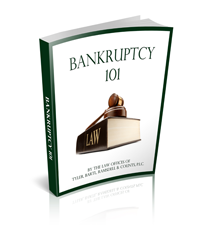 This e-book includes legal definitions, information on Chapter 7, 11 & 13 as well as tips you can use to protect yourself during bankruptcy.